Four days before his fortieth birthday in July 2004, Jürgen Klinsmann succeeded his former strike partner Rudi Völler to become the ninth Nationaltrainer. The news would be met with enthusiasm by some, and a deep scepticism by others. Klinsmann was seen by many as something of a maverick. His apparent remoteness, in particular his decision to base himself in the United States, had been interpreted as a clear lack of commitment to the German squad. This was an issue that continued to crop up whenever things went awry – a frequent scenario in what could fairly be described as a roller coaster two-year coaching career. Having started his career at local club Stuttgarter Kickers in the 2. Bundesliga, Göppingen-born Klinsmann moved to neighbours VfB where he forged his reputation as a tireless runner with a sharp eye for goal. Blessed with both strength and pace, Klinsmann’s exploits in the Bundesliga were quickly noticed. At the end of 1987, the young striker with the gazelle-like stride was picked for the Nationalmannschaft, making his debut at the end of the year against Brazil in Brasilia. By the following year, Klinsmann had made his way into Franz Beckenbauer’s starting eleven. The watching world would get their first good sighting of him at Euro 1988 where he made a positive impression, and later in the year he was part of the German team that claimed the bronze medal at the Olympic Games in Seoul. Knowing that their star striker had become a much sought-after asset, Stuttgart knew that the time had come for Klinsmann to seek new pastures, In 1989, he joined Internazionale in Serie A after five successful seasons at the Neckarstadion. By the time of the 1990 World Cup, Klinsmann was a household name and a sure-fire regular in the German team. The tournament in Italy was a wonderful one for Klinsmann, who started in all of West Germany’s seven matches. He more than played his part as the Mannschaft stormed to a third world title, scoring three goals and also winning the crucial penalty in the quarter-final against Czechoslovakia. Including his memorable finish in the second round game against the Netherlands, all of Klinsmann’s goals were scored at the San Siro in Milan, where he played his club football for Inter. The reunited Germany reached the final at Euro 1992 in Sweden, where Klinsmann again made an impression on the scoreboard. In the World Cup in the United States two years later, he was one of the few bright spots in what was a disappointing campaign. Germany would fall at the quarter-final stage in their quest to retain the title, with Klinsmann scoring five of the team’s total of nine goals. Having spent three productive seasons in Serie A, Klinsmann embarked on the start of what could be described as a European tour. He had become something of a nomad, a player for whom life was more than just football and where his career as a footballer was an opportunity to broaden his horizons. His three years in Italy were followed by two in France with AS Monaco, and in 1994 he crossed the Channel for a season in the Premiership with Tottenham Hotspur. With his self-deprecating sense of humour, Klinsmann was far from the constructed image of the “typical German”. Having been accused of play-acting by the English media, he used his first press conference to ask if there were any diving schools in London. This was followed by his now famous celebratory “dive” in front of the home fans after scoring his first goal. Before long, Klinsmann had overhauled tennis star and three-time Wimbledon winner Boris Becker as England’s favourite German. Klinsmann would have a successful season in England with Spurs, but soon felt the need to move again. In the summer of 1995, he returned to Germany, joining FC Bayern München. In what was at times a difficult season for Bayern, Klinsmann continued to find the back of the net. Having missed out on the Bundesliga title, the Bavarian club went on to win the UEFA Cup, with Klinsmann breaking the tournament record for the most goals in a single season – fifteen goals in twelve matches. Success at club level with Bayern was followed by more honours in the Nationaltrikot in 1996. Having been made captain by coach Berti Vogts, Klinsmann led from the front as Germany claimed a third European crown at Wembley. Despite being suspended for the opening match and suffering from injury problems during the tournament, he still managed to score three goals in four starts. Winning the World Cup in 1990 had been a great moment for Klinsmann, but there would surely have been something special about leading the team out at Wembley and collecting the Henri Delaunay Trophy from the Queen. Klinsmann would call time on his international career after the World Cup in 1998, a tournament that mirrored that of four years earlier. In what was another disappointing campaign that came to an end in the quarter-finals, he continued to stand out. By this time a veteran with over a century of international caps, the German skipper added another three goals to his World Cup tally, taking his total up to eleven in three tournaments – then joint fourth on the all-time list. Finishing with a total of 108 international caps and 47 goals, Klinsmann joined Rudi Völler in joint second place on the German top scorer list. He had become the first player to score three times or more in success FIFA World Cups (1990, 1994 and 1998) and was also the first to score in three separate editions of the European Championships (1988, 1992, 1996). At club level, Klinsmann continued with his globe-trotting. As his career drew to a close, another short spell in Italy with Sampdoria was followed by a return to England and another short spell at Spurs. In a professional club career spanning some seventeen seasons, Klinsmann had scored a total of 227 goals in 506 matches. The man popularly known in Germany “the Golden Bomber” – or simply “Klinsi” – was a far cry from the identikit modern footballer. Eschewing the glitz, glamour and fast lifestyle, he was often seen driving to training in his old Volkswagen Beetle. An urbane and educated individual who spoke four languages, the baker’s son from Baden-Württemberg lived a quiet family life. For him, a spell at a foreign club was not about chasing the media, falling out of nightclubs or appearances in tacky magazines, but immersing himself in that country’s culture while doing his job – scoring goals. When Klinsmann took the helm as Nationaltrainer from Rudi Völler in 2004, his remit was the complete revamp of the national team – though the first thing he chose to tackle was the structure and makeup of the management itself. Whereas previously the coaching setup had involved the Teamchef and an otherwise anonymous assistant, Klinsmann employed Euro 1996 winner Oliver Bierhoff as his public relations expert and former Stuttgart coach Joachim Löw as a more hands-on tactical advisor. He also applied a number of principles he had learned whilst working in the United States, supplementing his training staff with a raft of health and fitness gurus, motivational experts and sports psychologists. Klinsmann’s determinedly unorthodox approach to management left many in the German footballing establishment and media a little perplexed. They did not really know what to make of this managerial upstart, who had simply waltzed in and taken apart a system that had worked for decades. When it came to issues on the pitch, many felt that too much emphasis had been placed on attacking football – with Franz Beckenbauer in particular being one of Klinsmann’s harshest critics. In their assessment of Klinsmann and his methods, there were a number of things that Beckenbauer and others had not accounted for. Behind the happy face and affable demeanour, the former striker had steeled himself with the task of dragging German football out of the doldrums and into the twenty-first century. Such was his determination that he was willing to risk his own career and even ridicule in doing so. While his predecessor Rudi Völler had made the first concerted effort to involve younger and arguably less experienced players in the national setup, Klinsmann and his assistant Löw ramped this up. While the selection of younger players was nothing new – after all, the likes of Franz Beckenbauer and Uwe Seeler had made their international debuts before they were out of their teens – it had always been the exception rather than the norm. Under Klinsmann however, this was to be the default setting. When a player got injured, the policy was to look towards the future rather than the past in selecting a replacement. To get into the German squad in the 1980s, you would have had to have had at least three years of solid top-level experience. By the turn of the millennium, this approach had become unsustainable. In the 1970s and 1980s, there had been a wealth of top-class players to choose from; I am sure any German fan can name at least half a dozen players that might have been considered unlucky not to have played for the Mannschaft. Between 1998 and 2004 on the other hand, it appeared that anyone and his Hund could get into the squad – with journeymen like Michael Preetz, Olaf Marschall, Horst Heldt, Thomas Brdaric and the truly awful Paulo Rink getting to wear the Schwarz und Weiß. While it could be argued Völler’s arm had been twisted slightly in picking inexperienced youngsters, this was not an issue for Klinsmann and Löw, whose entire ethos had been based on youth. Players that had been on the fringe almost overnight became integral parts of what was being moulded into a dynamic squad, mainstays of a side geared towards the future. The team started to play with a more open and expressive style, but at the same time were more likely to leave holes in defence – something that continued to fuel Klinsmann’s critics. Klinsmann never seemed get a break. When things were going well he was national hero no. 1, but when an experiment went wrong he was suddenly this guy who had been spending too much time in America. When the Mannschaft were beaten by Italy 4-1 in March 2006, just three months before the start of the World Cup, Klinsmann’s head was again on the block. As far as the press were concerned the coach had one last chance to redeem himself – the next friendly in Dortmund against the United States. In good time, things had started to click. With a 4-1 defeat of the US the Klinsmann’s side had finally started to grow in confidence. Apart from a slightly jittery 2-2 draw with Japan where they found themselves having to come back from two goals down, the team had clearly picked up a momentum that they then took into the World Cup. The fear of a summer disaster was looming large, but the team would get things off to the flying start in the opening match of the tournament. Costa Rica were dispatched 4-2 in an exciting encounter in Munich’s Allianz Arena, and it was if a massive weight had been lifted off the team’s shoulders. It was “only” Costa Rica and critics were quick to point out the defensive issues, but the nightmare start envisaged by some had been avoided. Confidence grew quickly. The spectacular show against the Costa Ricans was followed by a gripping encounter with neighbours Poland, settled at the death. Then, a three-goal afternoon stroll against Ecuador. Three games, three wins. This was starting to look like a team, and Klinsmann seemed to have a permanent smile on his face. It was the face of a man who had been vindicated. Klinsmann’s team eased to a 2-0 second round win over Sweden, and followed this with an afternoon of pure drama in their quarter-final against old foes Argentina. Having come back from a goal down to take the game into extra time, the players showed that they had lost none of that old-fashioned German spirit in resulting penalty shootout. While the fans nerves were being shredded, the young team held their with a perfect display from the Elfmeterpunkt. Argentina had been one of the big favourites, and had been impressive from the start. Now they had been beaten by a German team many had written off before the tournament. Suddenly, nearly everyone in Germany was caught up in the enthusiastic fervour sparked by Jürgen’s Jungs. The German team were riding on the crest of a wave, and confidence was high ahead of the semi-final against another old foe, Italy. There, the fairy tale ended. An even contest had lasted right until the last minute of extra time, when every German heart was broken by one lethal swing of an Italian boot. When the Azzurri hit a second on the break just seconds later, it felt like all of the happiness had been sucked away. But this bad feeling would not last for long. The team could stand proud, taking the applause from the grateful home crowd as the strains of You’ll Never Walk Alone filled the warm Dortmund air. Yes, there was sadness, but also was a genuine sense that a corner had been turned. This young side had truly exorcised the trauma of Rotterdam six years earlier, and Jürgen Klinsmann now a national hero. Even arch-critic Franz Beckenbauer was on side, waxing lyrical about this attacking side that played beautiful football. It would not end there. Rather than wallow in the disappointment of the semi-final defeat, Portugal were summarily demolished in the third-place game in Stuttgart. In an otherwise meaningless match between the two beaten semi-finalists, Klinsmann and his team were determined to end their tournament on a high and not to let the home crowd down. The team played with confidence and verve, while Klinsmann was just as enthusiastic on the touchline as he would have been had his side reached the final itself. The Sommermärchen of 2006, and the role of Jürgen Klinsmann in particular, helped change the face of German football. The process had begun painfully, but it proved to be a gamble that had truly paid off. German football still had discipline and structure, but it could no more be described as one-dimensional. Suddenly, German players felt that they could score goals like the Argentinians and skip past opponents like the Brazilians. It was as if all the doors and windows had been opened. In the wake of the 2006 success and the Klinsmann-inspired revolution, Germany has become a factory for talented young players. Young players that are encouraged to knock on the door early, no longer afraid of having to wait five years before even being considered for the national team. Jürgen Klinsmann had always planned to resign from the post after 2006; in spite of loud calls both from the DFB and the German public for him to continue, he stuck to his guns. He had, in his own words, done what he had set out to do – it was now up to his successor to pick up the baton and follow things through. Klinsmann had not only restored Germany’s reputation as a top footballing nation, but he had reinvigorated its spirit. When his time as Nationaltrainer ended on July 12th 2006, the one demand he did make was that his assistant Joachim Löw be appointed his successor – a request that was carried out immediately. In doing this, continuity had happily been restored. Having resigned as coach of the Nationalmannschaft on the crest of a wave, Klinsmann took a few years out of football before returning to coaching in 2008 with former club FC Bayern München. The club as always were hungry for success, and much had been expected of the former national coach who brought with him an army of fitness specialists, sports psychologists and advisors. Unfortunately Klinsmann’s performance did not match the hype that accompanied his appointment, and he failed to make it through to the end of his first season in charge. 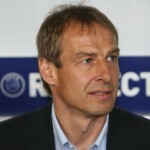 After another two-year hiatus and much media speculation, Jürgen Klinsmann was appointed head coach of the United States national team in July 2011. He took the US to the World Cup finals in Brazil in 2014, exiting the tournament in the second round after an extra-time defeat by Belgium. In the group phase, the Klinsmann was reunited with his former assistant Jogi Löw – who came out on top as Germany took the points with a 1-0 victory. Klinsmann had planned to take the US team to the 2018 World Cup in Russia, but the start to the final stages of the qualification campaign was a complete disaster. A 2-1 home defeat to Mexico had pushed Klinsmann towards the edge of the cliff, and this time there was no redemption. Following a catastrophic 4-0 defeat in Costa Rica, his tenure would come to an end.